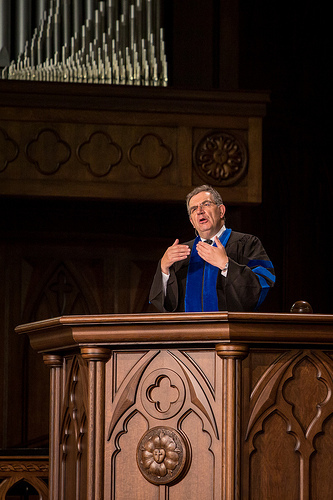 During the events of this past weekend’s 2013 Fall Conference and Preview Weekend at Reformation Bible College (RBC), attendees witnessed a significant event in the life of the College. Having entered its third year, RBC formally marked the beginning of the academic year with the convocation ceremony on Friday, September 27. The evening began with inspiring music by Reginald Lyle, playing the beautiful prelude of Highland Cathedral on the bagpipes, followed by the hymn, How Firm a Foundation as the College’s students and faculty, dressed in full academic regalia, processed into the sanctuary of Saint Andrew’s Chapel. 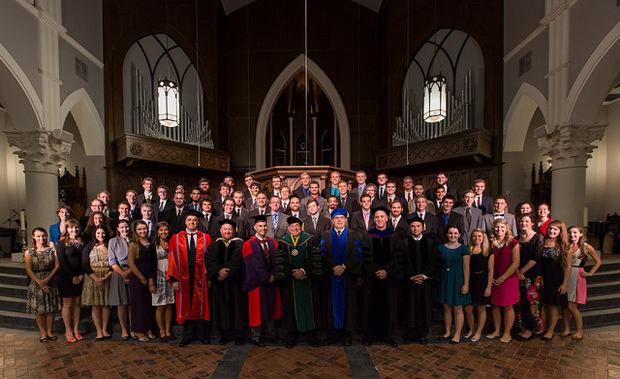 After the congregation sang the College hymn, Clothed in Righteousness, Dr. Sproul solemnly administered the faculty vows to Drs. Aaron Denlinger, Ben Dunson, Keith Mathison, Michael Morales, and R.C. Sproul Jr. Dr. Sproul closed the ceremony by offering a prayer of dedication for the academic year and proclaiming the benediction. In this third year, the RBC community has much for which to be thankful. This fall marked the entrance of the largest incoming class to date with 32 new students, bringing the total number of students enrolled to 77. In addition, the College added two full-time faculty members in the last year, with plans to add a third for the Spring 2014 semester. We are grateful for the prayers offered for RBC, and give thanks to the Lord for His continued provision.